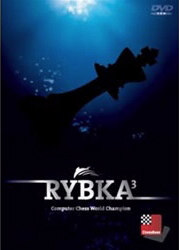 The beta version of the computer chess engine Rybka (which translates to “little fish”) was released in 2005 and it was quickly apparent that it would be a contender as the strongest chess engine in the world. By 2006 it had a rating of 3000, surpassing other engines by as many as 200 points, and in 2007 it became the 15th ICGA World Computer Chess Champion. Since then Rybka has had high-profile odds matches against a number of noted players. It won 4½-1½ against GM Jaan Ehlvest in 2007 and 6-2 against GM Joel Benjamin in a 2008 match in which Benjamin had white in every game and draws were counted as wins for him. Most recently, Rybka, ceding pawn and move in each game, scored 4-4 against GM Roman Dzindzichashvili. Rybka 3 now has an estimated rating of 3150. The Rybka team, IM Vasik Rajlich, IM Iweta Rajlich, IM Larry Kaufman, and Jeroen Noomen have been able to implement an active positional playing style resembling human chess into the program. This often results in long-term pawn or exchange sacrifices and an extraordinary understanding of dynamic factors. Rybka’s superior playing strength is most beneficial to the user via its interactive analysis, which helps you quickly assess a position. Endgames – engines often give high scores to drawn endgames (and sometimes low scores to winning ones). Monte Carlo recognizes fortresses and other no-progress situations. It’s also good in rook endgames, which are another computer problem. Positions where one side has made a big material sacrifice for slow compensation (i.e. not just tactics). For instance you can find lots of piece sacrifices in famous grandmaster chess games which no computer will correctly appreciate and which Monte Carlo gets right. Sampled Search gives detailed information about the search process, showing scores and alternative moves in the main line. This is helpful when the program searches for a long time in one position. It lets the users see how the engine is thinking and making its decisions. Singular Moves are annotated graphically. This indicates situations where only one clearly best move exists. Look for win: whenever you feel that there should be a forced win in a position you can explicitly ask for it. Rybka then searches for a decisive move, considerably faster than in normal analysis. Persistent Hash: Rybka can save its hash tables between analysis sessions to preserve valuable information already accumulated in the search tree. Of course, there are many, many more uses for Rybka 3. It also includes a database of one million games and one year access to the chess server Playchess.com. System requirements: Minimum: Pentium 1 GHz, 512 MB RAM, Windows Vista or XP (SP 2), DVD ROM drive, Windows Media Player 9. Recommended: pc Intel Core Duo 2.4 GHz or higher, 4GB RAM, Windows Vista, GeForce8 or compatible graphics card with 256 MB RAM or higher, 100% DirectX compatible sound card, Windows Media Player 11, DVD ROM drive.